KRAVolution Krav Maga is a close combat instructor, ordered officially by a lot of military units worldwide! For example, we are official instructor for the French Foreign Legion and ordered by the German defense ministry. 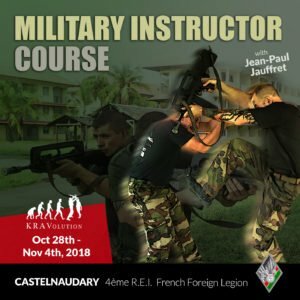 Our next KRAVolution Military Instructor Course will take place from 28th October to 4th November 2018 at the 4ème R.E.I. “Régiment d’Instruction de la Légion étrangère” in Quartier Capitaine Danjou in Castelnaudary – south of france. This outstanding Krav Maga Military Instructor Course enables to teach military Krav Maga and to guide and train for instance Soldiers of the German Armed Forces. The content of the Course is based on the military training of Imi Lichtenfeld and contains the imparting of the necessary didactical skills for the supporting management of the Krav Maga training for soldiers under consideration of the rules of engagement. The goal of the training is to hand over effective and easy techniques to the instructors. So that they can show the soldiers how to react when it comes to violent attacks. The Course will take place from October 28th – November 4th, 2018 at the 4ème R.E.I. “Régiment d’Instruction de la Légion étrangère” in Quartier Capitaine Danjou in Castelnaudary – south of france. all participants receive a Krav Maga Military Instructor certificate and the military patch indicating the expertise. This course offers the highest level of training for military Instructors and our goal is to bring out good, quality teachers, who can train their own units. Along the lines of earned, not given, we don´t provide a guarantee to pass and to get the KMI Krav Maga Instructor certificate. It´s on the participant! Furthermore, our course is not a further education acknowledged from the federal states or a course offered by the German Armed Forces, but is for participants with a respective background. If you are not an KRAVolution Instructor, a corps identity card and an over-average fitness level are required. There is no need for experiences in Krav Maga as this course is about further professional training to become an instructor. Education experience is an advantage though. 1990 EUR for KRAVolution Members and Instructors only!